Arizona teachers and education advocates march in front of the Arizona Capitol highlighting low teacher pay and school funding in Phoenix. Teachers in Arizona are staging what they're calling a walk-in today. They're asking lawmakers for a 20 percent pay raise and for school funding to return to pre-recession levels. This comes as teachers in Oklahoma continue their walk-out. After more than a week of protests and dozens of closed schools across the state, Oklahoma lawmakers have already agreed to increase teacher pay and school funding. But teachers say, after a decade of deep cuts, it's not enough. "I have been saying, 'Why aren't [teachers] in the streets? What took them so long?'" says Sylvia Allegretto, a labor economist at the University of California, Berkeley. She's compared teachers' weekly wages to workers with similar levels of experience and education and says teachers consistently earn less — especially in states that have seen walkouts. In Arizona, for example, Allegretto says teachers make about 63 cents on the dollar compared to other college graduates. In Oklahoma, it's 67 cents. "These are really huge pay gaps," Allegretto says, "and over a career, it means these workers are out tens and maybe hundreds of thousands of dollars." "Teachers in Arizona are actually at the bottom of the heap in most of my years of the analysis. And teachers in Oklahoma are pretty near that," says Bruce Baker, who has also studied wage competitiveness and teaches education finance at Rutgers University. He mentions Tennessee and Colorado as other states with a teacher wage gap. "What's really so striking to me is that it's had to get this bad. It was kind of like that slow boil over time." How bad is this bad? First, a quick look at school spending overall. According to one study, more than half of states were still spending less per student in 2015 than they were before the Great Recession. For more on that — a lot more — check out NPR's 2016 School Money project. When you focus on teacher salaries, which make up the lion's share of schools' spending, data published by the Education Department show that, after adjusting for inflation, U.S. teachers earned less last year, on average, than they did back in 1990. In Oklahoma, teachers' wages averaged $45,245 last year, down roughly $8,000 in the past decade. 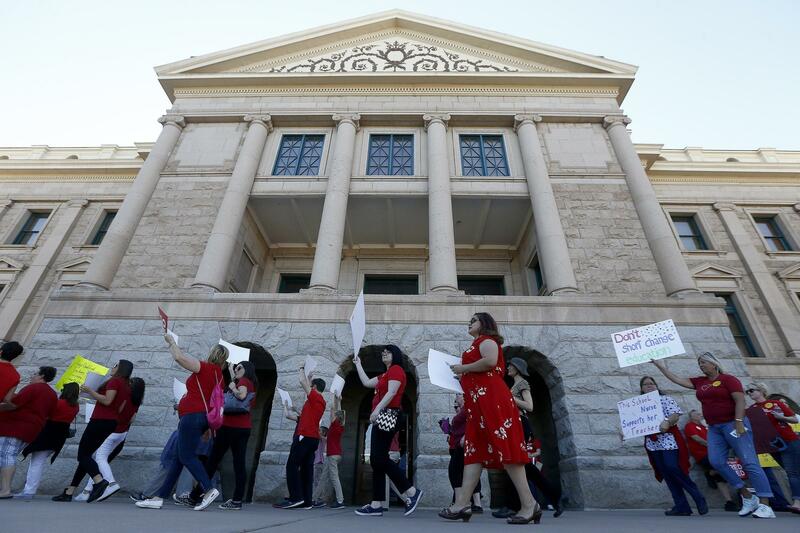 Over the same span, in Arizona, teachers' wages are down roughly $5,000. Now, not everyone who studies teacher pay sees a compensation crisis. "I don't believe they're undercompensated at all," says Andrew Biggs, who studies retirement issues at the American Enterprise Institute. Biggs says all this talk of teachers being underpaid ignores many of the other benefits they get. Like summers off, he says. And the big one: pensions. "The reality is that teacher pensions are a lot more expensive," Biggs says, "and they're also a lot more generous than people think they are." But Chad Aldeman, the editor of teacherpensions.org, says it's the other way around. "There's this idea of this gold-plated pension system out there, but that's not the case for the vast majority of teachers who enter the profession." That's because new teachers often have to stay in the profession — and in the same place — for 5 to 10 years before they can get any kind of pension. "In the median state, about half of all new teachers won't stick around long enough to qualify for any pension at all," Aldeman says. As a result, only about 15 to 20 percent of teachers really benefit from the current system. To make matters worse, in many states, teachers don't qualify for Social Security benefits, either. So they really depend on that pension. Aldeman believes one reason some non-teachers have a misperception about teacher pensions is because, in many states, lawmakers complain a lot about how much money they're pouring into the plans. The problem, says Aldeman, is that most of that money isn't going directly to teachers. On average, for every dollar in salary a teacher is paid, employers spend 17 cents on retirement costs. "Of that 17 cents, about five of it is actually going to benefits, and 12 of it is going to pay down unfunded pension obligations," Aldeman says. This brings the problem full-circle; some states are now using these big pension debts to justify not giving teachers a pay raise. "Total education spending is clearly rising," AEI's Andrew Biggs says. "What is stagnating is spending on school classrooms, you know, for teachers, for class materials, for things like that." Years of spending cuts have led to teacher shortages in many communities, making it hard to recruit and retain new teachers for whom the low pay is all too real and the pension, an abstraction. This is especially true of college graduates with expertise in math and science who can earn more money outside the classroom. Bruce Baker, at Rutgers, says state lawmakers need to start asking themselves: "Who do we want to get to go into teaching, and how much are we going to complain about it if we don't get the people we want?" It's going to be harder and harder, he says, for some states to tell their new college graduates: 'We value teachers!' When the numbers tell a different story. Teachers in Arizona staged a walk-in today. They didn't leave their jobs but protested in front of schools. They're asking lawmakers for a big raise in pay and also in school funding. This is happening as teachers across Oklahoma continue their walkout and after teachers in West Virginia got the raise they wanted by striking for more than a week. In the next few minutes, we're going to take a bird's eye view of this national fight over teacher pay and ask, how did we get here? Here's NPR's Cory Turner. CORY TURNER, BYLINE: When you put that question to people who study teacher pay, you'll often hear something like this. SYLVIA ALLEGRETTO: I have been saying, you know, why aren't they out in the streets? What took them so long? TURNER: Sylvia Allegretto is a labor economist at UC Berkeley. She's compared teachers' weekly wages to workers with similar levels of education. And she says teachers consistently earn less, especially in states that have seen protests. ALLEGRETTO: These are really huge pay gaps, and over a career, that means these workers are out tens and maybe hundreds of thousands of dollars. TURNER: On the other side of the country, Bruce Baker teaches education finance at Rutgers. BRUCE BAKER: What's really so striking to me is that it's had to get this bad. TURNER: How bad is this bad? According to one study, more than half of states were still spending less overall per student in 2015 than they were before the Great Recession. When you look just at teacher salaries, data published by the Department of Education show that after adjusting for inflation, U.S. teachers earned less last year on average than they did back in 1990. Now, for those of you who can't remember 1990, this was one of the year's top songs. MC HAMMER: (Rapping) You can't touch this. Yo, sound the bell, school's in, sucker. You can't touch this. TURNER: Clearly MC Hammer was not talking about teacher salaries. Now, not everyone who studies teacher pay sees a compensation crisis. ANDREW BIGGS: I don't believe they're undercompensated at all. TURNER: That's Andrew Biggs at the American Enterprise Institute. He says all this talk of teachers being undercompensated ignores many of the other benefits they get, like summers off and the biggest one of all. BIGGS: The reality is that teacher pensions are a lot more expensive, and they're also a lot more generous than people think they are. TURNER: But Chad Aldeman, the editor of teacherpensions.org, says not so much. CHAD ALDEMAN: There's this idea of this gold-plated pension system out there. But that's not the case for the vast majority of teachers who enter the profession. TURNER: That's because to get any pension at all, teachers often have to stay in the profession and in the same place for five or even 10 years. ALDEMAN: About half of all new teachers won't stick around long enough to qualify for any pension at all. BIGGS: Total education spending is clearly rising. What is stagnating is spending on school classrooms, you know, for teachers, for class materials, things like that. BAKER: Who do we want to get to go into teaching, and how much are we going to complain about it if we don't get the people we want? TURNER: It's going to be harder and harder, Baker says, for some states to tell their new college graduates we value teachers when the numbers tell a different story. Cory Turner, NPR News, Washington. Transcript provided by NPR, Copyright NPR.